Weeds can be a avenue of gastronomical adventure. Today I’ve had my first taste of a weed called Onion Grass (Romulea rosea) of the Iris family (Iridaceae). The scientific name actually refers to the Roman emperor Romulus and the specific epithet ‘rosea‘ alludes to the flower’s pink rosy petals. Other common names of this plant include Guildford Grass and Rosy Sandcrocus. Onion grass is an endemic of the Western Cape Province in South Africa. It is actually a rather attractive plant, the pink flowers having a yellow center with dark streaks radiating from it. 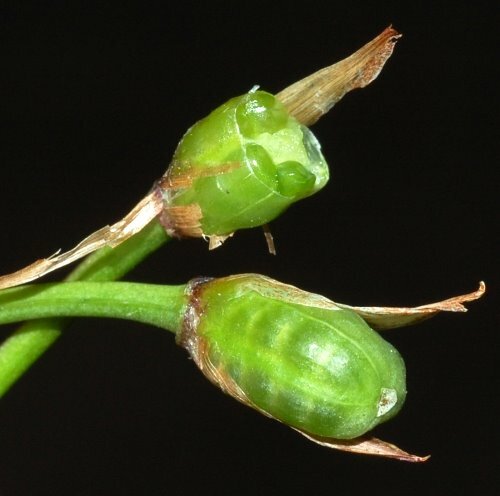 The green unripe fruits of the Onion Grass appear in late spring, on a stalk that curves downward toward the soil, presumably getting ready for seed dispersal. In summer the fruits dry out and split, releasing numerous brown seeds. Perhaps as a result of it’s efficient dispersal strategy and it’s ability to produce corms, Onion grass has become a permanent fixture in grassy landscapes in Australia and Tasmania, and pops up unfailingly every spring. 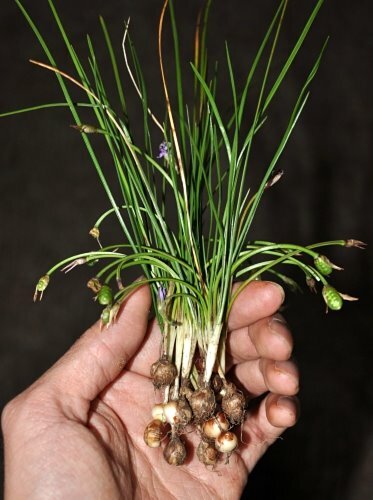 I highly doubt that the Tasmanian aborigines had much opportunity to make Onion grass part of their diet but there is no reason why WE cannot included it as a bush tucker plant. However, please see my DISCLAIMER if you should attempt to eat any plant described under my Bush Tuck posts. Though small (c. 1 cm in length), the unripe fruit of the Onion grass makes for a nice snack. It might appeal to those with a sweet tooth. I could graze on this all day. My partner took an instant liking to it too. Apparently, we are latecomers to this bush delight. Many older Australians on the mainland have relished the Onion grass fruits in their childhood days (see discussion on Flickr). Some people even refer to the fruits as ‘Plum Puddings‘. Peeling the fruit wall off to get to the fleshy seeds seems pointless for such a small fruit. It was simpler to just bite into the fruit and chew till the sweet juices of the seeds are exhausted. The small pea-sized turnip-shaped corms are edible too. Assuming what I can only hope approximates the flair of an aborigine, I dug up some corms using an ad hoc digging stick, pealed away the brown outer skin, and chewed on white-fleshed interior. The initial taste was one of very concentrated water chestnuts (Eleocharis dulcis) but this was followed by a rather bitter aftertaste. I probably wouldn’t eat too many corms if I could help it. However, I have read that Long-billed Corellas (Cacatua tenuirostris) and Water Hens (Porphyrio porphyrio) seem to like the corms. Next spring I’d be looking out for more ‘Plum Puddings’. This entry was posted in Bush Tucker, Introduced Plants and tagged Bush Tucker, edible plants, Guildford Grass, Iridaceae, Onion grass, Plum Pudding, Romulea rosea, Romulea rosea var. australis, Rosy Sandcrocus. Bookmark the permalink. I am delighted to have discovered your beautiful website and a soul who adores plant life as much as you do. By no means have I explored your site fully–springtime sunshine in Victoria is too precious to give over to sitting in front of a computer–but I shall do so later. 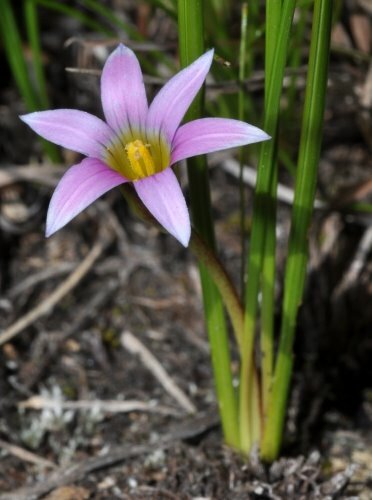 I found your website because I was searching for compliment-ary information about Romulea rosea (instead of all that stuff about its being a pest). Watching the cockatoos all last summer ploughing up the ground to get at their corms made me wonder how good a food source these might be “come the revolution”. Having piled huge quantities of mulch on top of my raised garden beds over winter, I am now pulling up the green leaves so that the whole plant emerges from our slippery black-clay soil; I find that the corm can be nearly a foot below the soil’s surface. Have you since found out if any study of the properties of these corms has indicated they may not be safe to eat in quantity–say, pulversised to make a sort of flour? I am so touched by your “worship” of Winifred Curtis. I visited her in 1995 in her nursing home. She had got herself quite a large room on the ground floor on the north side of the river which overlooked a garden in which she had managed to grow a few flowers. Her room was lined with book-shelves and her reference books, for she was still in the process, I seem to recall, of completing the Flora of Tasmania. Her parting gift to me was some exquiste notepaper decorated with Wahlenbergia. I am curious to know what you do in Cairns. I lived most of my adult life (I am now 67) on the Atherton Tablelands–with a marvellous nine month stint in Paluma. Perhaps you have come to know a little of these forests? Have you come across the wonderful botanist, Dr. Peter Stanton? Happy days to you and your partner in Far North Queensland. Thank you for your extensive work. It must be excited to be in a field on your own passion. I am working on a formula the involves a certain type of onion grass found in the South Pacific Island of Tonga. It is used for ointments and body lotions. I can still remember picking it for my grandmother to make bath lotions for me. The taste of it was a little bitter nutty taste. Definitely not like an onion taste. But I remember these onion grass as not to have flowers like the one displayed on these pages. Would you know if they are of the same family or type. You input would be appreciated.